Sweet, tasty and all-natural, our Honey Candy hits the spot! Made with pure honey, our candies are gluten-free and do not contain any corn syrup or artificial flavors or colors, making this a worry-free, enjoyable treat. Even better, our Honey Candy soothes sore, scratchy throats during winter, helping you feel better when cold and flu season comes around. If you spend a lot of time outdoors — such as skiing — in the winter, our Honey Candy will keep your mouth moist and comfortable while you’re enjoying winter activities. It’s a treat that brings comfort any time of year – we hear that our honey candies help soothe sore throats caused by seasonal allergies, and natural honey is said to be a great natural source of energy. You’ll find 36 candies in our Honey Candy packages, ready for sharing with your family and friends, and we love hearing about how our customers also include our Honey Candies in their own DIY gift collections. Our Honey Candy has been one of our customer favorites at all of the craft shows and holiday shows we’ve done the past 10 years. 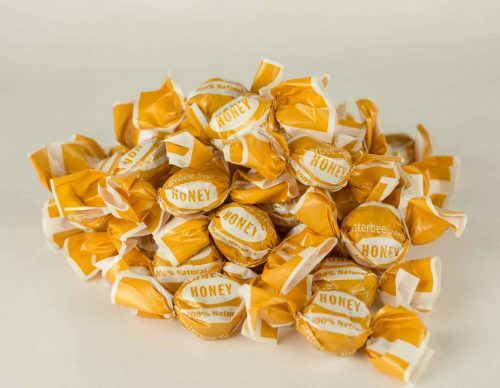 Ready to take a taste of our all-natural, gluten-free honey candies? Order here, or contact us if you have any additional questions about this or about any of our other pure honey products that can join your honey candies as your arsenal of all-natural allergy- and cold or flu season remedies. And even if you’re not in need of a sore throat solution, our Honey Candies are delicious treats to savor!